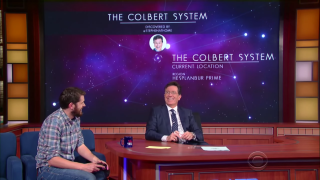 "I thought Morgan Freeman was God," Stephen Colbert told Sean Murray last Friday, You're actually my second God." "By entire universe," He asks, "Do you mean something the size of... the universe?" Hello Games created a new periodic table for the game that has "oxycen" instead of oxygen (is oxygen trademarked?). Spaceships heat up as they enter the atmosphere. You can point something that looks like a gun at animals to name them, and you get money for doing so. You can walk around underwater. The only way to know what your avatar looks like is for somebody else to see you, though the chance of running into somebody else is very rare. Worth a watch for Sean Murray naming a solar system after Stephen Colbert, and for the bit where the audience gets the scope of what Hello Games is doing with No Man's Sky and applauds.